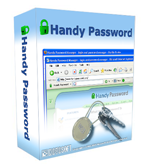 If you are looking for password software, which uses cutting-age technologies and simplifies login and form filling we recommend the latest version of Handy Password. Random password generator is built into the password software and allows you to automate password creation and start using strong password instead of simple human-made. Bookmark manager and automatic login function will help you to access your accounts automatically without filling login and password fields manually. Password software will do it for you automatically all you need to enter is to click on the site in bookmark manager. Form filler will automatically fill out your forms with all the necessary details, which you have to save to the program only once instead of doing the same form filling again and again, then program will do all the job for you automatically. Handy Password software also can provide you with high level of security, which without any doubts is necessary for storing passwords. Password manager software stores all passwords and other personal information in the encrypted database. The master-password to access your database is the only one password you will have to keep in mind with Handy Password software. Download Password manager - password manager software.